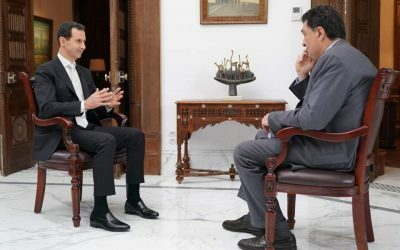 In an exclusive interview with Kathimerini, Syrian President Bashar al-Assad denied that the Syrian Army used chemical weapons against civilians, while taking aim at both Turkish President Recep Tayyip Erdogan and US President Donald Trump. He accused Erdogan of being “affiliated” with the Muslim Brotherhood Islamist movement and called Turkish troops “terrorists” over their intervention in Afrin. Alexis Papachelas: There have been accusations from the US and the Europeans about the use of chemical weapons, and there was an attack after that. What is your response to that? Was there a chemical attack? Were you responsible for it? Second, the use of weapons of mass destruction (WMD) in a crammed area with a population like Douma – the supposed area, it’s called Douma and they talk about 45 victims – when you use WMD in such an area, you should have hundreds or maybe thousands of victims. Third, why do all the chemical weapons – the presumed or supposed chemical weapons – only kill children and women? They don’t kill militants. If you look at the videos, it’s completely fake. I mean, when you have chemical weapons, how could the doctors and nurses be safe, dealing with the chemical atmosphere without any protective clothes, without anything, just throwing water at the victims, and the victims become OK just because you washed them with water. So, it’s a farce, it’s a play, it’s a very primitive play, just to attack the Syrian Army, because… Why? That’s the most important part: When the terrorists lost, the US, France, the UK and their other allies who want to destabilize Syria lost one of their main cards, and that’s why they had to attack the Syrian Army, just to raise the morale of the terrorists and to prevent the Syrian Army from liberating more areas in Syria. AP: Are you saying that there was a chemical attack and someone else is responsible, or that there was nothing there? PBA: That’s the question, because the side who said – allegedly – that there was a chemical attack, had to prove that there was an attack. 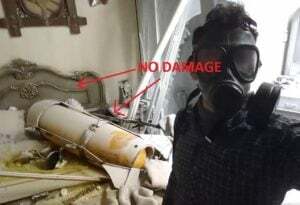 We have two scenarios: Either the terrorists had chemical weapons and they used them intentionally, or maybe there were explosions or something, or there was no attack at all, because in all the investigations in Douma, people said, “We didn’t have any chemical attack, we didn’t see any chemical gas or smell any,” and so on. So, we don’t have any indications about what happened. The Western narrative is about that, so that question should be directed at the Western officials who said there was an attack. We should ask them: Where is your concrete evidence about what happened? They only talk about reports. Reports could be allegations. Videos by the White Helmets – the White Helmets are funded by the British Foreign Office – and so on. AP: In a tweet, US President Donald Trump described you as “animal Assad.” What is your response? PBA: Actually, when you are president of a country, you have first of all to represent the morals of your people before representing your own morals. You are representing your country. Does this language represent the American culture? That is the question. This is very bad, and I don’t think so. I don’t think there’s a community in the world that has such language. Second, the good thing about Trump is that he expresses himself in a very transparent way, which is very good in that regard. Personally, I don’t care, because I deal with the situation as a politician, as a president. It doesn’t matter for me personally; what matters is whether something would affect me, would affect my country, our war, the terrorists, and the atmosphere that we are living in. AP: He said “mission accomplished in Syria.” How do you feel about that? PBA: I think maybe the only mission accomplished was when they helped ISIS escape from Raqqa, when they helped them, and it was proven by video, and under their cover. The leaders of ISIS escaped Raqqa, going toward Deir ez-Zor just to fight the Syrian Army. The other mission accomplished was when they attacked the Syrian Army at the end of 2016 in the area of Deir ez-Zor when ISIS was surrounding Deir ez-Zor, and the only force was the Syrian Army. The only force to defend that city from ISIS was the Syrian Army, and because of the Americans’ – and of course their allies’ – attack, Deir ez-Zor was on the brink of falling into the hands of ISIS. So, this is the only mission that was accomplished. If he’s talking about destroying Syria, of course that’s another mission accomplished. While if you talk about fighting terrorism, we all know very clearly that the only mission the United States has been carrying out in Syria is supporting the terrorists, regardless of their names, or the names of their factions. AP: He also used such language with the North Korean leader, and now they’re going to meet. Could you potentially see yourself meeting with Trump? What would you tell him if you saw him face to face? PBA: The first question you should ask is: What can you achieve? The other: What can we achieve with someone who says something before the campaign, and does the opposite after the campaign, who says something today, and does the opposite tomorrow, or maybe in the same day? So, it’s about consistency. Do they have the same frequency every day, or the same algorithm? So, I don’t think that in the meantime we can achieve anything with such an administration. A further reason is that we don’t think the president of that regime is in control. We all believe that the deep state, the real state, is in control, or is in control of every president, and that is nothing new. It has always been so in the United States, at least during the last 40 years, at least since Nixon, maybe before, but it’s becoming starker and starker, and the starkest case is Trump. AP: When will you accomplish your mission, given the situation here in Syria now? PBA: I have always said, without any interference, it will take less than a year to regain stability in Syria; I have no doubt about that. The other factor is how much support the terrorists receive, which is something I cannot tell you, because I cannot predict the future. But as long as it continues, time is not the main factor. The main factor is that someday, we’re going to end this conflict and we’re going to reunify Syria under the control of the government. When? I cannot say. I hope it’s going to be soon. AP: There has been some criticism lately, because you apparently have a law that says that anybody who doesn’t claim their property within a month cannot come back. Is that a way to exclude some of the people who disagree with you? PBA: No, we cannot dispossess anyone of their property by any law, because the constitution is very clear about the ownership of any Syrian citizen. This could be about the procedure. It’s not the first time we have had such a law just to replan the destroyed and the illegal areas, because you’re dealing with a mixture of destroyed and illegal suburbs in different parts of Syria. So, this law is not about dispossessing anyone. You cannot, I mean even if he’s a terrorist. Let’s say, if you want to dispossess someone, you need a verdict by the judicial system – you cannot make it happen by law. So, there’s either misinterpretation of that law, or an intention, let’s say, to create a new narrative about the Syrian government in order to rekindle the fire of public opinion in the West against the Syrian government. But about the law, even if you want a procedure, it’s about the local administration, it’s about the elected body in different areas, to implement that law, not the government. AP: It is clear that your biggest allies in this fight are Russia and Iran. Are you worried they might play too important a role in the future of the country after this war is over? PBA: If you talk about my allies as a president, they are the Syrian people. 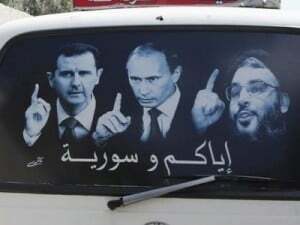 If you talk about Syria’s allies, of course they’re the Iranians and the Russians. They are our strongest allies, and of course China that supported us politically in the Security Council. As for them playing an important role in the future of the country, these countries respect Syria’s sovereignty and national decision making and provide support to insure them. Iran and Russia are the countries which respect Syria’s sovereignty the most. AP: It’s been a few years since you visited Greece. Your father had a very close relation with some of the Greek political leaders. How have the relations been between Greece and Syria these days, and what kind of message would you like to send to the Greek people? PBA: At the moment, there are no formal relations between Syria and Greece; the embassies are closed, so there are no relations. At the same time, Greece wasn’t aggressive towards what happened in Syria. It always supported a political solution, it never supported war or attacks against Syria. You didn’t play any role to support the terrorists, but at the same time, as a member – and an important member – of the EU, you couldn’t play any role, let’s say, in refraining the other countries from supporting the terrorists, violating the international law by attacking and besieging a sovereign country without any reason, without any mandate by the Security Council. So, we appreciate that Greece wasn’t aggressive, but at the same time, I think Greece has to play that role, because it’s part of our region. It is part of the EU geographically, but it’s a bridge between our region and the rest of Europe, and it’s going to be affected, and it has been affected by the refugee situation, and terrorism now has been affecting Europe for the last few years, and Greece is part of that continent. So, I think it’s normal for Greece to start to play its role in the EU in order to solve the problem in Syria and protect the international law. AP: How about Turkey? Turkey invaded part of your country. You used to have a pretty good relationship with President Recep Tayyip Erdogan. How is that relationship now after the Turkish invasion? PBA: First of all, this is an aggression, this is an occupation. Any single Turkish soldier on Syrian soil represents occupation. That doesn’t mean the Turkish people are our enemies. Only a few days ago, a political delegation visited from Turkey. We have to distinguish between the Turks in general and Erdogan. Erdogan is affiliated with the Muslim Brotherhood. Maybe he’s not organized, but his affiliation is toward that ideology, I call it this dark ideology. And for him, because, like the West, when the terrorists lost control of different areas, and actually they couldn’t implement the agenda of Turkey or the West or Qatar or Saudi Arabia, somebody had to interfere. This is where the West interfered through the recent attacks on Syria, and this is where Erdogan was assigned by the West, mainly the United States, to interfere, to make the situation complicated, again because without this interference, the situation would have been resolved much faster. So, it’s not about personal relations. The core issue of the Muslim Brotherhood anywhere in the world is to use Islam in order to take control of the government in your country, and to create multiple governments with this kind of relationship, like a network of Muslim Brotherhoods, around the world. AP: At an election campaign rally this week, he said that he’s going to order another incursion into Syria. How are you going to respond to that if it happens? PBA: Actually, Erdogan has supported the terrorists since the very beginning of the war, but at that time, he could hide behind words like “protecting the Syrian people,” “supporting the Syrian people,” “supporting the refugees,” “we are against the killing,” and so on. He was able to appear as a humanitarian president, let’s say. Now, because of these circumstances, he has to take off the mask and show himself as the aggressor, and this is the good thing. So, there is no big difference between the head of the Turkish regime sending his troops to Syria and supporting the terrorists; this is his proxy. So, we’ve been fighting his army for seven years. The difference between now and then is the appearance; the core is the same. At that time, we couldn’t talk about occupation – we could talk about supporting terrorists – but this time we can talk about occupation, which is the announcement of Erdogan that he’s now violating the international law, and this could be the good part of him announcing this. AP: But how can you respond to that? PBA: First of all, we are fighting the terrorists, and as I said, the terrorists for us are his army, they are the American army, the Saudi army. Forget about the different factions and who is going to finance those factions; at the end of the day, they work for one agenda, and those different players obey one master: the American master. Erdogan is not implementing his own agenda; he’s only implementing the American agenda, and the same goes for the other countries in this war. So, first of all, you have to fight the terrorists. Second, when you take control of more areas, you have to fight any aggressor, any army. The Turkish, French, whoever, they are all enemies; as long as they came to Syria illegally, they are our enemies. AP: Are you worried about a third world war starting here in Syria? I mean, you have the Israelis hitting the Iranians here in your own country. You have the Russians, you have the Americans. Are you concerned about that possibility? PBA: No, for one reason: Because fortunately, you have a wise leadership in Russia, and they know that the agenda of the deep state in the United States is to create a conflict. Since Trump’s campaign, the main agenda was against Russia, create a conflict with Russia, humiliate Russia, undermine Russia, and so on. And we’re still in the same process under different titles or by different means. Because of the wisdom of the Russians, we can avoid this. Maybe it’s not a full-blown third world war, but it is a world war, maybe in a different way, not like the second and the first, maybe it’s not nuclear, but it’s definitely not a cold war; it’s something more than a cold war, less than a full-blown war. And I hope we don’t see any direct conflict between these superpowers, because that is where things are going to get out of control for the rest of the world. 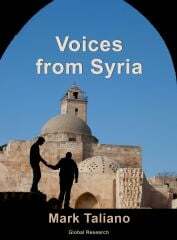 AP: Now, there’s a very important question about whether Syria can be a unified, fully sovereign country again. Is that really possible after all that has happened? PBA: It depends on what the criteria of being unified or not is. The main factor to have a unified country is to have unification in the minds of the people, and vice versa. When those people look at each other as foreigners, they cannot live with each other, and that is where you’re going to have division. Now, let’s talk about facts and reality – not my opinion, I can tell you no, it’s not going to be divided, and of course we’re not going to accept that, but it’s not about my will or about my rhetoric, to say we’re going to be unified; it’s about the reality. The reality, now, if you look at Syria during the crisis, not only today, since the very beginning, you see all the different spectrums of the Syrian society living with each other, and better than before. These relationships are better than before, maybe because of the effect of the war. If you look at the areas under the control of the terrorists, this is where you can see one color of the Syrian society, which is a very, very, very narrow color. If you want to talk about division, you have to see the line, the separation line between either ethnicities or sects or religions, something you don’t see. So, in reality, there’s no division till this moment; you only have areas under the control of the terrorists. But what led to that speculation? Because the United States is doing its utmost to give that control, especially now in the eastern part of Syria, to those terrorists in order to give the impression that Syria cannot be unified again. But it’s going to be unified; I don’t have any doubt about that. AP: But why would the US do that if you’re fighting the same enemy: Islamic terrorism? PBA: Because the US usually has an agenda and it has goals. If it cannot achieve its goals, it resorts to something different, which is to create chaos. Create chaos until the whole atmosphere changes, maybe because the different parties will give up, and they will give in to their goals, and this is where they can implement their goals again, or maybe they change their goals, but if they cannot achieve it, it’s better to weaken every party and create conflict, and this is not unique to Syria. This has been their policy for decades now in every area of this world. AP: Looking back, do you feel you’ve made any mistakes in dealing with this crisis and the civil war, when it started? PBA: If I don’t make mistakes, I’m not human; maybe on a daily basis sometimes. The more you work, the more complicate the situation, the more mistakes you are likely to make. But how do you protect yourself as much as possible from committing mistakes? First of all, you consult the largest proportion of the people, not only the institutions, including the parliament, syndicates, and so on, but also the largest number of people, or the largest part of society, to participate in every decision. While if you talk about the way I behaved toward, or the way I led, let’s say, the government or the state during the war, the main pillars of the state’s policy were to fight terrorism – and I don’t think that fighting terrorism was wrong, to respond to the political initiatives from different parties externally and internally regardless of their intentions, to make a dialogue with everyone – including the militants, and finally to make reconciliation. So, about the pillars of our policy, I think the reality has proven that we were right. As for the details, of course, you always have mistakes. AP: How much is it going to cost to reconstruct this country, and who is going to pay for that? PBA: Hundreds of billions, the minimum is 200 billion, and according to some estimates it’s about 400 billion dollars. Why is it not precise? Because some areas are still under the control of the terrorists, so we couldn’t estimate precisely what the figure is. So, this is plus or minus, let’s say. AP: There has been a lot of speculation. For example, people say in order for a political solution to be viable, you might have to sacrifice yourself for the good of the country. Is that something that has crossed your mind? PBA: The main part of my future, as a politician, is two things: my will and the will of the Syrian people. Of course, the will of the Syrian people is more important than my will, my desire to be in that position or to help my country or to play a political role, because if I have that desire and will and I don’t have the public support, I can do nothing. After seven years of me being in that position, if I don’t have the majority of the Syrian people’s support, how could I hold it for more than seven years now, with all this animosity from the strongest and the richest countries? Who supports me? If the Syrian people are against me, how can I stay? So, when I feel that the Syrian people do not want me to stay anymore, of course I have to leave without any hesitation. AP: A lot of blood has been spilt. Can you see yourself sitting across from the opposition and sharing power in some way? PBA: When you talk about blood, you have to talk about who spilt that blood. I was president before the war for 10 years. Had I been killing the Syrian people for 10 years? No, definitely not. So, the conflict started because somebody, first of all part of the West, supported those terrorists, and they bear the responsibility for this war. So first of all the West, who provided military and financial support and political cover, and who stood against the Syrian people, who impoverished the Syrian people and created a better atmosphere for the terrorists to kill more Syrian people. So, part of the West, mainly France, UK, and US, and also Saudi Arabia and Qatar and Turkey are responsible for this part. Of course blood has been spilt – it’s a war – but who’s responsible? Those who are responsible should be held accountable.